This week's 52 Weeks Blog Challenge topic is my biggest fashion accessory. Considering my idea of fashion is trading the sweatpants for leggings and the old t-shirt with bleach stains for a clean white one... Fashion obviously isn't my thing. So, if I have to pick a fashionable accessory, it would be lipstick. My first 'real job' boss insisted INSISTED you wear lipstick and if you didn't have your own, she'd make you wear hers. (It was funnier than it sounds.) And that was the beginning of my lipstick addiction. It doesn't have to be lipstick. Lip balm, lip gloss (as long as it's not sticky) or even plain Vaseline will do. But I have to have something on my lips and I have to reapply it every 15 minutes. Okay, that may be a slight exaggeration. Or not. The point is, I'm addicted to.... let's just call it lip product. 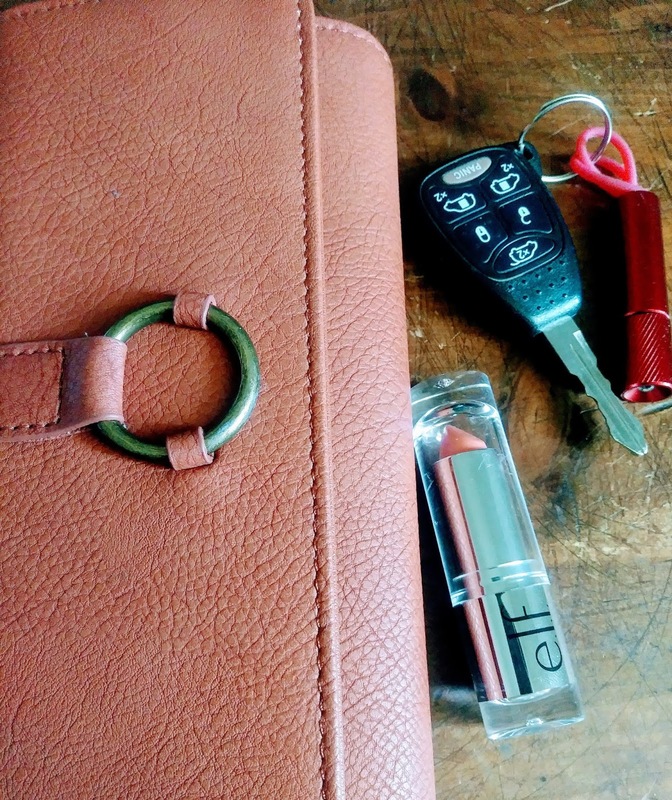 And nothing brings me more joy than finding Elf's Perfect Peach lip tint on clearance. I bought three. Reading your post made me realize I have no must have fashion accessory. I try to leave the house in clean to mostly clean clothes. It doesn’t bother me that they are old. Comfort is more important. The only thing I never leave the house without is a book or crafty project, does this count? I may try some Burt’s Bees tinted lip balm. I’ll be so fancy! I’ve been enjoying your blog challenge, lots of fun. I am a lip balm addict too. I have one stashed in all my pockets. I can't tell you how many I have washed by accident. Can a boss do that? hm..I wear the same religious medals but that isn't really a fashion accessory is it? I like my chapstick and I just bought an organic lip balm that is tinted that I like. Clinique used to make a lip gloss that I loved. it was more like a "stain" than a lipstick. They don't make it any more So many I've tried are just too gummy for me. I'll have to look for the Elf one. Love chapstick, especially cherry flavor! My accessory would have to be shawls, scraves, cowls. Love having something to wrap around my shoulders or loosely looped around my neck. It jazzes up any old T-shirt!